On the same day Multnomah County announced a 10 percent increase in people experiencing homelessness, Oregon announced cuts to emergency rent assistance. If that didn’t add enough insult to injury, the state also proposed a 6 percent cut to other general-fund expenditures from the current service levels that include funding for a low-income rental fund, elderly rental assistance and other support services. That’s a loss of tens of millions of dollars to our most vulnerable Oregon residents. The lack of urgency by our state is both uninspiring and unbelievable. To be honest, it’s a slap in the face. Unfortunately, it’s not a surprise. For whatever reason, Oregon Democrats and Republicans have never really prioritized housing in a way that’s resulted in any substance. It’s one of the many reasons Oregonians are facing a housing crisis from Bend to Lincoln City, from Ashland to Portland. It’s more than frustrating. In this session alone, legislators have gutted proposals to reform landlord/tenant laws and kept intact a billion-dollar kickback to Oregon homeowners through the Mortgage Interest Deduction program. Make no mistake — Oregon is in fact subsidizing housing. Unfortunately, it’s for the rich, who can afford second and third homes around the state. 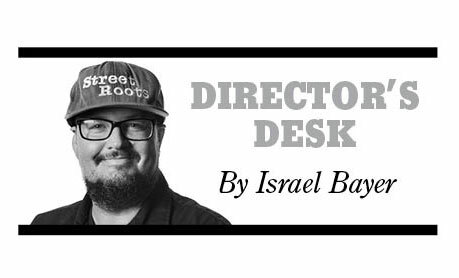 Israel Bayer is the executive director of Street Roots. You can reach him at israel@streetroots.org or follow him on Twitter @israelbayer. What’s even more infuriating for housing advocates is watching how Portland Tenants United has been vilified on one hand, and mainstream advocates have been ignored on the other. How does a group of people showing up to a senator’s church to protest his stance on housing result in other legislators throwing a public tantrum and saying that’s the reason they won’t support real tenant reforms. The message sent to advocates and concerned residents from Salem is: Come hard at us, be discredited. Come soft at us and play our political games, get ignored. Ultimately, you don’t really fit into our larger plans. How can the people not feel ignored when Oregon’s funding and track record on housing is already woefully underfunded? Then, they propose cutting millions of dollars for rent assistance. The political optics of legislators in Salem right now is so far off center that it’s hard to have a real conversation. All of this, of course, comes without even factoring in devastating proposed federal cuts to housing programs across the board. If local and state officials think street homelessness and gentrification are bad today or that the private sector and public are fatigued now, all communities are in for a rude awakening when all of these cuts begin to take place. The reality is we are still experiencing and will continue to experience a housing crisis. That’s not being an alarmist; that’s being real. It’s only my humble opinion, but I think any elected official in Oregon who doesn’t continue to show urgency and treat the housing crisis like an actual emergency and fight like hell for more ongoing revenue for housing is on borrowed time. They should be. Not one elected official should remain in office in the metro area without actively engaging in solutions to the housing crisis, period. Talk is cheap. Actions are real. We still don’t have an answer for tenant rights long term or a plan for ongoing revenue for homeless services or a real plan to stop gentrification. All the equity plans in the world aren’t going to stop people of color from being pushed out of the city and region unless you actually invest in equity and housing. The signal coming out of Salem and Washington, D.C., is clear. You’re on your own, Portland, Ashland, Bend, Astoria, etc. That means locally, we’ve got work to do – a lot of it. We must rise above the rhetoric and the lack of support and work for what’s best for our city and region. If you aren’t thinking big, get out of the way. The housing crisis will not be solved by taking shortcuts or managing homelessness or the politics of any given situation. If Portland voters' passing of a housing bond and election of Chloe Eudaly in November wasn’t a signal to the establishment that unless you offer up real solutions, the people are going to speak, then I don’t know what is. Get mad, get organized, let your voice be heard. Write your elected officials today, and take action. It’s hands up for housing!